IBM DATABASE 2 Version 9.1 for z/OS (DB2 9 for z/OS throughout this publication) is the thirteenth release of DB2 for MVS. - Rich hybrid support for relational and pure XML data. - Enhanced support for key business partners that allow you to get more from your data in critical business disciplines like ERP. - A brand new user interface for the Query Management Facility to view and analyze data from either a workstation client or an ordinary Web browser. - Streamlined security and regulatory compliance through the implementation of roles, network-trusted contexts, and enhanced auditing. - Performance-boosting innovations such as load and reorg CPU reductions, improved varying length data, logging, and insert performance. - Query management enhancements to make accessing data even faster and more accurate with indexing improvements. - Database on demand capabilities to ensure that information design can be changed dynamically, often without database outages. - DB2 restart improvements enhancing performance usability and availability in data sharing environment. 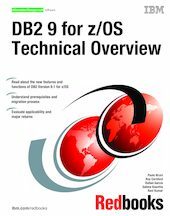 This book introduces the enhancements made available with DB2 9 for z/OS. It helps you understand the new functions, justify investment in migrating, and plan for exploiting the key new capabilities.